Ripley’s Believe It Or Not carries a lot of information of things that are beyond “normal”. The Bible tells of things like a metal ax head that floated (2 Kings 6:6), a coin found in a fishes mouth (Matthew 17:27), and how a boatload of disciples was on the sea and they see Jesus coming to them walking on the sea, and as soon as he gets into the boat, they are immediately at the land where they were going (John 6:21). That is just three of many, many, supernatural events recorded all through the Bible, all to the glory of God. Barb and I took a trip to northern Arkansas. Tuesday she looked at her planner/calendar/record book that stays in her purse. This book carries all kinds of vital information such as social security numbers and passwords. After returning home Wednesday, it was discovered to be missing. The purse and the car were searched thoroughly. The hotel in which we stayed was asked to search the room twice. Once a general call was made, then contact was made with a manager, with whom we had made acquaintance, stressing to him the importance of the book. He personally did an in-depth search of the room. No book. Barb and I agreed in prayer and in calling by faith that the book be found and returned. The fear of what could happen if the book fell into the wrong hands had to be laid to rest. The only people we told was the hotel manager and desk clerk and the two people in whose car we rode on the trip. Friday night we had a function in the church. 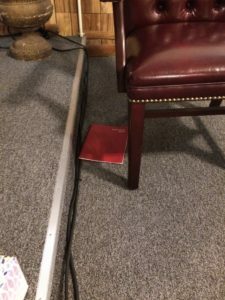 Had the book been lying on the floor by the chair at the front of the sanctuary, it would have been seen. Sunday morning the church was cleaned by the cleaning lady. Had she found it, she would have turned it in. That morning Barbara spoke on the glory of God. I sat in the chair at the front side of the sanctuary where I usually sit. 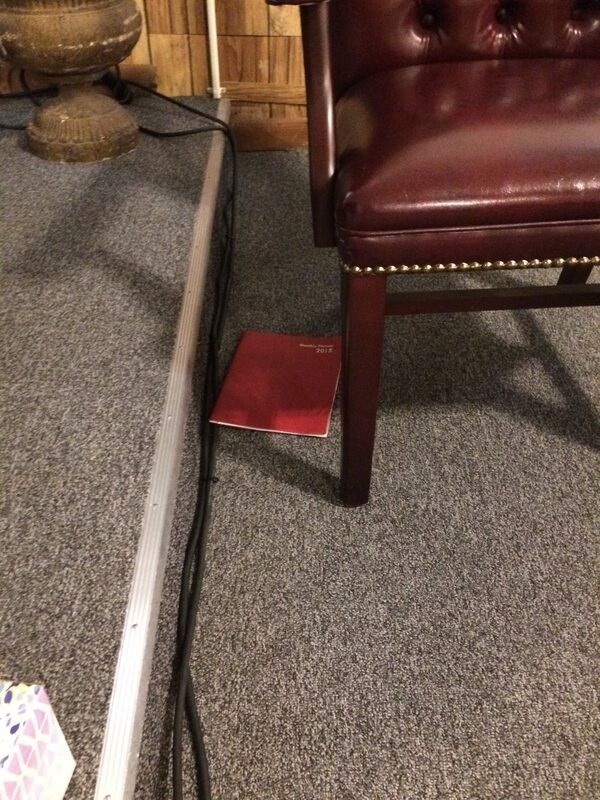 Through the whole event, no red book was laying beside my chair. At the end of the service I got up and walked away from the chair in some ministry activity. When I turned to go back to my chair, my eyes fell on a red book laying beside the chair. My mouth fell open. I picked the book up and handed it to Barbara. She also was astounded. When we settled down a bit, we told the story to the church of losing the book. We all rejoiced giving all glory to God for getting the book back to us. I have tried to figure out a reasonable explanation for what happened. There is none. One moment it was not there. The next moment it was. You can believe it or not. Bottom line, we now have the book, all to the glory to God.